The finished product, with a significant "detour" into my backyard. It’s good to eat fish at least once every week. It’s full of Omega-3 fatty acids that our bodies need. Don’t worry about what you read about risks associated with eating fish. Regardless of the contaminants that may be present in some types of fish numerous studies have shown that the benefits far outweigh the risk. The Omega-3 fatty acids provide many heart health benefits including reducing the risk heart attack, stroke and heart disease. Omega-3s also help prevent arterial clogging, which can be fatal. 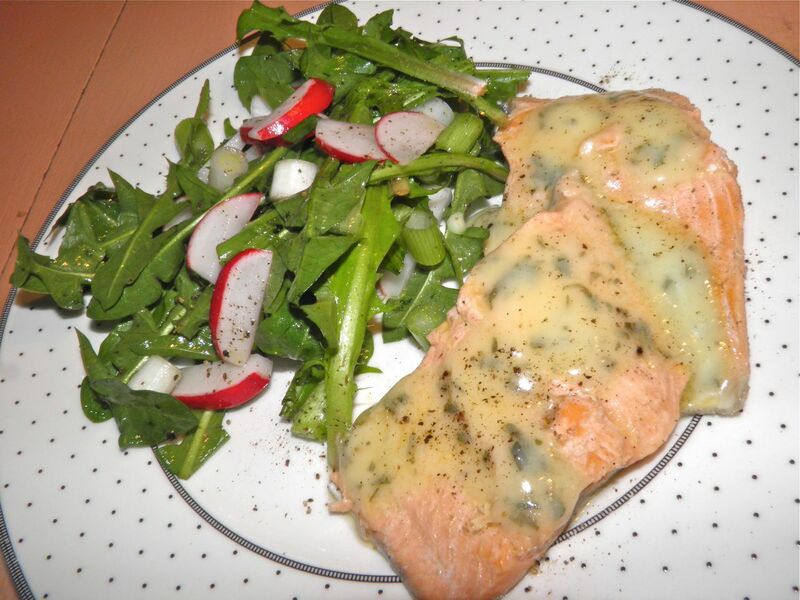 The consumption of trout reduces bad cholesterol (LDL) as well as blood pressure. Trout also protects the body against circulatory problems like thrombosis and gout. So I bought a rainbow trout filet. Fairly cheap too, at $5.30 for 350 g. I’ll have to keep that cost in mind. It’s far cheaper than salmon… If you’re lucky enough to know where you can catch your own the fish will be free! Trout fishing season is currently happening in Nova Scotia. Trout can be prepared many ways: fried, baked and poached to name just three. I chose poached. It’s a quick way to prepare it and doesn’t allow the fish to dry out. So next up was what to accompany it. Once again, many choices. I chose a salad. We don’t eat nearly enough salad. That, and I had the remainder of a head of romaine lettuce in the refrigerator… or so I thought. So I get home and go for the romaine. No romaine. And no time to go to the grocery. The trout was already poaching. If you ever find yourself in a similar situation do not panic. There’s always something you can substitute. I had picked up green onions and radishes for the rest of the salad. The radishes still had their greens attached. I had never tasted radish leaves before. Now I know why. After a nibble I realized they just wouldn’t do. It’s not that they were bad, but they're very sharp. I could see using them as an additional green in a salad but not the main one. So now I was in a bind. I had nothing else acceptably green “in the house.” What about outside? Outside also has the benefit of being free. A quick look at the edge of our property showed bright, young, tender dandelions. I had dandelion greens last year with fish but it was later in the season. 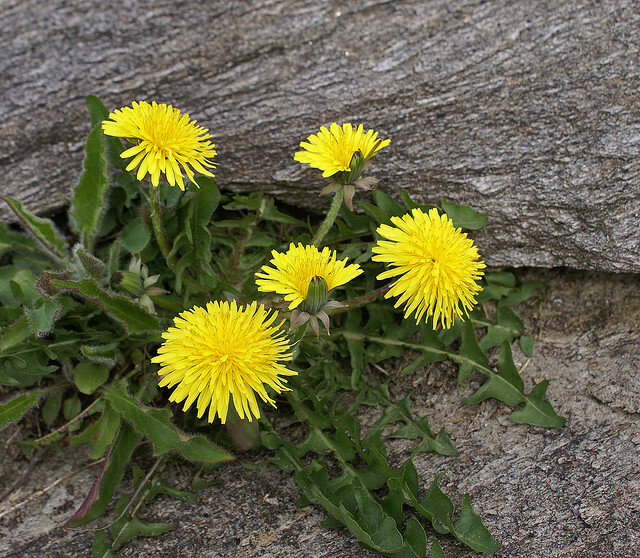 They still were fantastic and I remember young dandelion was supposed to be even more choice. That remembrance was correct. So I carried on with my recipe and had dinner (part of it free) on the table in no time flat. I made a blackberry vinaigrette from vinegar posted on this blog a week or two ago. Never discount what you may be able to find in your yard to eat. Just be sure of what you’re picking, and that it’s not polluted (pr peed on), and you’re good to go. This is what I made (all recipes). To feed more than 2 you should probably buy more trout. Everyone will want more. additional flavour. This is half of the trout filet. Cut the trout into serving sized pieces. Your choice. Place enough water in a wide sauté pan to cover the fish when it is added. Add the celery, onion, pepper and salt and bring to a boil. Simmer for 3 minutes. 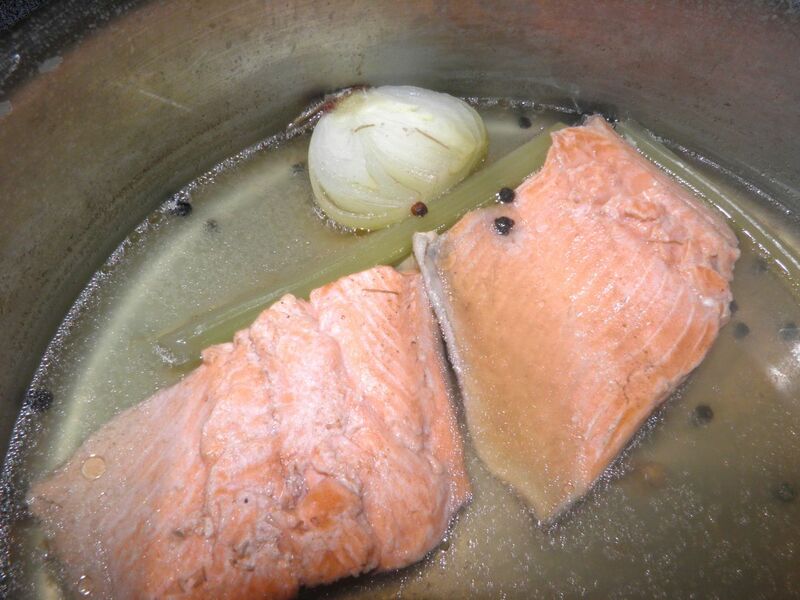 Add the trout and let it simmer for 7 minutes or until cooked through. before this photo was taken. It came back together. While the trout is simmering prepare the sauce. Melt the butter and add the lemon juice and black pepper. Whisk well. Add the cornstarch and whisk again. At this point the sauce may very well “break” meaning the fat separates. Don’t worry. 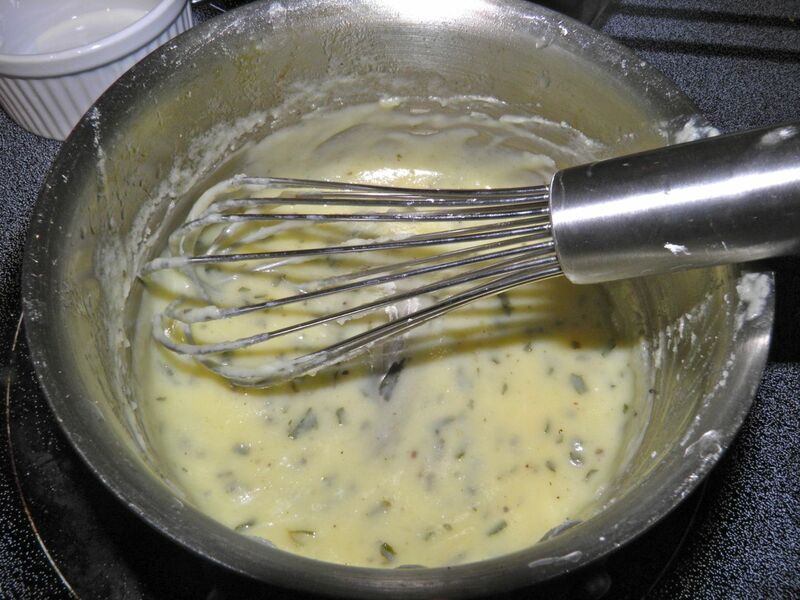 Let the butter sauce cool down and whisk once it’s cooled a little. It will come back together. If it gets too thick, heat it up a little. Server on top of the trout. Combine the dressing ingredients in a jar and shake vigorously. If the leaves are too large to be manageable, tear them up. Place the dandelion, green onions and radishes in a bowl. Pour the vinaigrette on top and toss well.